Christmas Quiz: Count the Health and Safety Violations! Merry Christmas to you all! Here’s my If Wishes Were Horses festive quiz: count the health and safety horrors committed by “Little Miss Fearless” in this short Pathé video from 1933 1923*. I’ve spent most of 2015 slogging away to finish book two, The Age of the Horse, which will be out at the end of August. More exciting news to follow on this severely neglected blog. *Thanks to YouTube commenter Antarch for pointing this out. Manhattan’s carriage horses aren’t the only ones whose livelihood is under threat. When the ritzy Claremont Riding Academy on West 89th Street closed down in 2007, many thought that it was the last riding school on the island. Not true. The New York Riding Academy was founded by Dr George Blair in 1988, and offers free lessons to local kids every summer in Randall’s Park in Harlem. Former governor Mario Cuomo gave Blair permission to use a scrap of wasteland he’d cleared of debris, and, five years and several hundred thousand dollars of his own money later, Blair had the stable up and running. For thirty years, the kids of Harlem have been learning to ride in the park. But. all that changed this summer when the Parks Department blocked off access to a road that the couple used to bring supplies to the stables, stopped mowing their lawn, and took about 100 feet of the grazing land, Blair said. The Parks Department asked for permission to use a bit of their land to install a container to store rental bikes, said his wife, Ann Blair, 74. Dr. Blair was furious that the Parks Department would take over land used to provide free services to children in order to store bike rentals that local children can’t afford and the park profits from, he said. More about the subsequent negotiations can be found here at DNA Info, but it doesn’t look good. Ebony Horse Club in Brixton, London and Stepney Bank in Newcastle are two community riding programmes that have found support and continue to make a difference to local kids, although it looks like the project working with Dublin “pony kids” has evaporated (if it hasn’t, I’d love to find out more). The Emilie Faurie Foundation provides riding lessons at schools across the country. Wormwood Scrubs Pony Centre is (among other things) a Riding for the Disabled facility of long standing. Horses in the Hood works with youth in South Central LA. However, lately it’s seemed that many of the campaigns to ostensibly improve the welfare of urban horses seem to involve working against their owners rather than with them. Most of the establishments targeted recently by campaigners and city authorities happen to be those run by people who are both poor and, often, not white: some Baltimore “street arabbers” lost horses earlier this year, Fletcher Street Riding Club in Philadelphia was bulldozed, and the Cedar Lanes Stables of the Federation of Black Cowboys was shut down. The Westway stables in London are underthreat of being replaced with a skate park. Stables are not viewed as contributions to communities, perhaps because horses are still seen as the domain of the rich and the spoiled. And my goodness, the space they take up that could be converted into nice luxury apartments… AHEM. To me there also seems to be a bit of a disconnect between the generosity of horselovers to rescues or therapy programmes, and the cold shoulder shown to potentially life-changing urban projects for kids. We horse-crazy people know just what gifts we were lucky enough to experience in our own horsey childhoods, and yet beyond charity appeals for great organisations like Riding for the Disabled, I don’t see much fundraising to help bring that joy to children who don’t have much else. Go to any equestrian chat forum and you’ll see one familiar refrain come up among the battles over barefoot vs. shod and feeding regimens: other people don’t understand equestrianism. Why aren’t there more horse sports on the TV like there used to be? Why don’t cyclists and motorists slow down for horses? Are people really complaining about horse manure on roads? 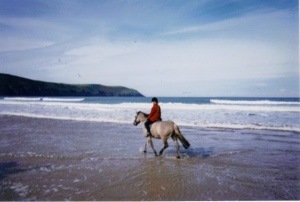 Why do people dismiss me as a posh idiot when I say I own horses? Why don’t people understand how important the issue of horse slaughter is, or what’s happening to mustangs? Why don’t they know how great equine-assisted therapy is? And yet in cities everywhere there are projects that have the potential not just to improve the lives of locals, but to educate the world in general about what horses are, and what they can contribute. Stables that could give homes to rescued horses (look at Zig Zag, rescued by Redwings and now at Ebony Horse Club). That provide a place of comforting routine and daily escape for children in trouble. That could help bring fresh, healthy food to “food deserts“. That could be the heart of communities. And all of these projects need our support. Sasa’s name means “so-so” in Portuguese. It’s a little joke, because the gray lusitano gelding is anything but — he’s a beautiful horse who can, like many Iberian equines, claim descent from the war horses of the Renaissance. Look at Uccello’s “Battle of San Romano” and there’s Sasa’s likeness carrying a Florentine general: compact as a rubber ball, strong enough to balance on his hinds, and with a crested neck that ends in ears tilting forward like his rider’s lance. This a piece I’ve written for the New York Times‘ Menagerie blog and horses and how we communicate with them. When I publish something I like to provide a little cheat sheet and some links to source material, because most of the readers who like this blog also want to do their own investigating and reading around. Here’s the paper on horses and heart rates. This is the Uccello painting, The Battle of San Romano, which is at the National Gallery in London. People have (rightly) wanted to know how on earth a horse could realise that its rider was pregnant. Here is the anecdote behind it, from the Horse and Hound Forum. The horse in question was a challenging ride for its owner. One day, its behaviour changed, and it was good as gold. This was odd, and odder still when the good spell went on for weeks. The owner happened to take a pregnancy test after a while, and had a positive result. The horse (a mare, if that’s relevant) continued to be biddable and obedient until the owner’s baby was born, at which point it reverted to its old, challenging behaviour. What this doesn’t tell us, of course, is HOW the mare knew, and WHY she acted differently. But if there are dogs and other service animals that can detect an oncoming epileptic fit or a cancerous tumour, I see no reason why a horse should not. A little “unpacking” for the term sprezzatura, as some of the sense of the piece got lost in a series of last minute additions and edits. There’s a line missing before that sentence, which is, “My instructor calls this the art of doing bugger all.” Sprezzatura is indeed a Renaissance term, but I’m not sure if it was directly applied to riding by contemporaries. It’s championed by Castiglione in his Book of the Courtier, and there’s a little explanation here. My source/inspiration was a really excellent thesis on riding, the Renaissance and sprezzatura by Treva Tucker, called Destrier to Danseur: The Role of the Horse in Early Modern French Noble Identity. She unpacks it far better than I can in my wee NYT piece, so hunt it out. This is the page for my memoir, If Wishes Were Horses: A Memoir of Equine Obsession, and some more photos of Tav. You can get a US Kindle edition here. Here’s a couple of videos of Sasa in action with a much better rider than I (he and Holly Barber are currently ranked 10th in the world in Working Equitation). And here’s the school that owns him: Pine Lodge in Norfolk, UK. Hurrah to these four, who spared the time in the run up to holiday madness to take the tardis back to childhood and remember pony mania. I wish you horses under your Christmas tree and subscriptions to Horse and Hound all round. You endured not only ponylessness but even broken bones, parental bafflement and life-limiting zoning laws in your pursuit of Horse. And perhaps – maybe – we discovered that sometimes it is better to travel horsefully than to arrive. But I will still be accepting any donations of unwanted lusitanos this festive season. You know, if you bought too many. In Shel Silverstein’s poem “Little Abigail and the Beautiful Pony,” Abigail’s heartless parents tell her nobody ever died from not getting a pony and deny her endless requests for one. Guess what happens to poor Abigail. As I filled the Connemara-shaped hole in my own life with horse-substitute activities, I wondered, too, at my parents’ obtuseness…I mean, really, how hard could it be to buy the neighbors’ house, knock it down, fence the land, and stock it with horses? Toy horses, horse books, galloping around the yard neighing shrilly, and drawing horses sublimated the desire for a horse but didn’t satisfy it. I finally took matters into my own hands by cutting brown paper bags into horse body-part shapes and fashioning a life-sized horse on a wall. I’d greet this Dobbin every day before school. Then I’d turn my attention to a smaller but more malleable steed made of non-hardening modeling clay, with pebbles for hooves and a yarn mane and tail. This one lived in a shoebox stable with a green-towel pasture. He got fresh water in a small bucket, a pile of grass for hay, and regular turn-out. On cold days, he wore handmade felt blankets. Actually, I think Clay Horse preferred it cold. He became distinctly bandy-legged when it was hot, and his hooves would fall off. Nobody ever said horse ownership was easy. Fastforward a few decades, and my own horse-crazy daughter picks up the baton. She begs to eat her noodles without utensils (“they’re hay!”) and plops an old saddle on the pile-up of lawn chairs that stands in for a horse. Now she owns an actual horse. I pat its nose (and, yes, kiss it). So hang in there, Abigail. Sometimes ponies come to those who wait. My first pony was called Beauty. Black with a white star, he was sleek and swift as the wind. Beauty came to me when I was five years old. I would ride him to school and tie him to the drainpipe during lessons. Beauty went everywhere with me. Up and down the road, round the garden, on long journeys in my Dad’s old Cortina. He could shrink down into my pocket and hide away safely. Nobody knew about Beauty, of course. As I grew older, suspicion was raised in the playground as I would trot and gallop, whinnying shrilly. My white, platform sandals that were, perhaps, a little old for a then seven year old, were pleaded for, not for their fashion flare, but for the clip clop cloppiness of their wooden soles against the tarmac. Time passed and Beauty took on a new form as I learned to ride a hand-me-down bicycle. Eventually I got POCKET MONEY. I would save up for three week and cycle four miles each way for a half an hour of terror, clinging onto the evil old riding school skewbald’s mane, while he tried to ditch me. How I loved him. I fell off once and broke my elbow. I didn’t tell my Mother for fear of the lessons being banned. It was a week before I took my anorak off and she found out. I sort of grew up, eventually, but Beauty is still with me, and we still have a little gallop when nobody is watching. I grew up in London, where horses are few, and those that are there cost a lot. Real contact with horses was limited to occasional rides on holiday, and those glorious Sundays when polo was played near Richmond Park. “Treading in” between chukkas, and walking where horses had been. I was taken to see the Harness Horse Parade, where I breathed in the smell of Horse. One marvellous time, I went to watch at Olympia. For the rest of the year, imaginary horses had to stand in, and in many ways these were more real to me than the flesh & blood type. I had a lot of Britains horses. These formed herds which roamed happily around my bedroom floor. There were fights between stallions, foals born, horses rounded up and sold. They all had names, and complicated relationships. I acquired a riding hat but no pony to ride. I kept the hat. 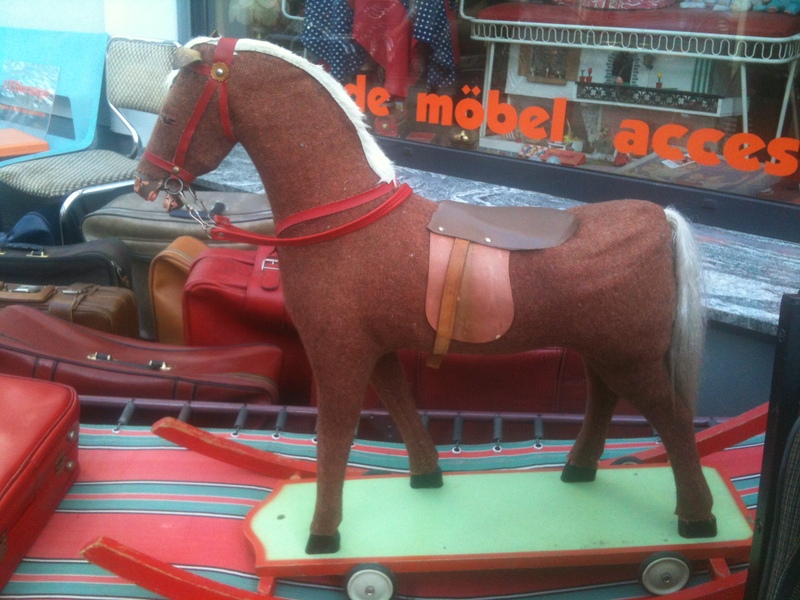 It gave me hope that maybe, one day, I’d have the pony to go with it. Show jumping, when I was a child, was a big thing on television, not something you had to hunt for in the distant corners of subscription tv. For someone convinced they were a horse, who’d for some inexplicable reason ended up a child, playing show jumping was the acceptable face of being that horse. Half passing along the pavement was definitely considered odd, but copying Ann Moore was fine: except I was April Love, or Ryan’s Son, or Penwood Forge Mill. Occasionally the dog would be allowed to be the horse, and jump my splendid course of pea sticks stuck into the lavender hedge, but mostly I hogged the part of horse myself. Unfortunately my equine alter-ego had no sense of sympathy for her herd. My sister and best friend would join in the show jumping games, and my sister fell at the saw horse, our equivalent of the puissance wall. We encouraged her to get up, get on her metaphorical horse again, and continue, but she carried on crying, and eventually even our stern, proto-Pony Club Commissioner selves realised Something Was Up. She’d broken her collar bone. We were banned from jumping again. No more bamboo stick and flower pot doubles. No more oddly balanced deckchairs, and definitely no more hurtling towards the saw horse, heart in mouth, the excitement of getting whole to the other side almost, but not quite, as good as the thrill of jumping on a real horse. So thank you again, ponyless sisterhood. Send me an email with your postal address and any requests for dedications in the book, and I will send your copies off ASAP! I’ve caught a few photos of horsey toys at local flea markets, and for a second I thought the one that appears in this Spiegel gallery was one I’d spotted before, but maybe not. Thomas Henk Henkel photographed aficionados of the Mauerpark flea market and their booty, and here’s a beautiful old hoss and its cute new owner. Another one for the cause! The Huffington Post have a great slideshow showing the evolution of MLP from the babyish but still equine Cotton Candies of the early 1980s to the bizarre-o “Equestria Girl” of 2013, a new model that’s an even stranger mutant than the hideous “Struts, fashion-forward ponies” that were unveiled and then disappeared a few years ago. Equestria Girl is a kind of anime-goth human–horse hybrid whose designers must have had at least one knowing eye on the pony girl fetish scene, which also draws on Japanese comic book and goth influences. The mini skirts, the brightly coloured hair, the stacked boots… It’s a direct appeal to the much-trumpeted “Brony” craze that’s seen young men adopt a girl’s toy and cue up an avalanche of press interest and pseudo-analysis. How did we get here? I got the idea for My Little Pony because a pony or horse was the only thing I ever wanted. The sellers, all men of course, said they couldn’t sell it. But the VP of marketing said he was going to stick with it. He thought it was his wife’s idea, which if she hadn’t had it, my idea wouldn’t have seen the light of day. I was the inventor of My Little Pony, though several people claim that. I am the undisputed designer, along with the original sculptor. So there you have it: marketing has taken a girl’s love of horses from realism to kitsch to sexualisation, keeping MLP at the forefront of a long-running Western tendancy to anthropomorphise animals and sexualise children. Will the Equestria Girls be a hit with real little girls, or are they solely for the cosplay-attending Bronies and Pegasisters? Which is the better source of cash and brand loyalty for Hasbro? What do little girls really want? ** Excuse choppiness and scant blogging. I’m hard at work on plans for book two, and it’s making coverage here skimpy. Do enjoy the Amazon reviews of the book, too.